Crystal River is fun, fun, fun! Abundant in natural beauty, wildlife, history, and entertainment, this is a city on Florida’s Gulf Coast that you need to visit. Below are our top recommendations for things to do in Crustal River. Here at BTTM, we always embrace the idea of discovering what’s in your own back yard. 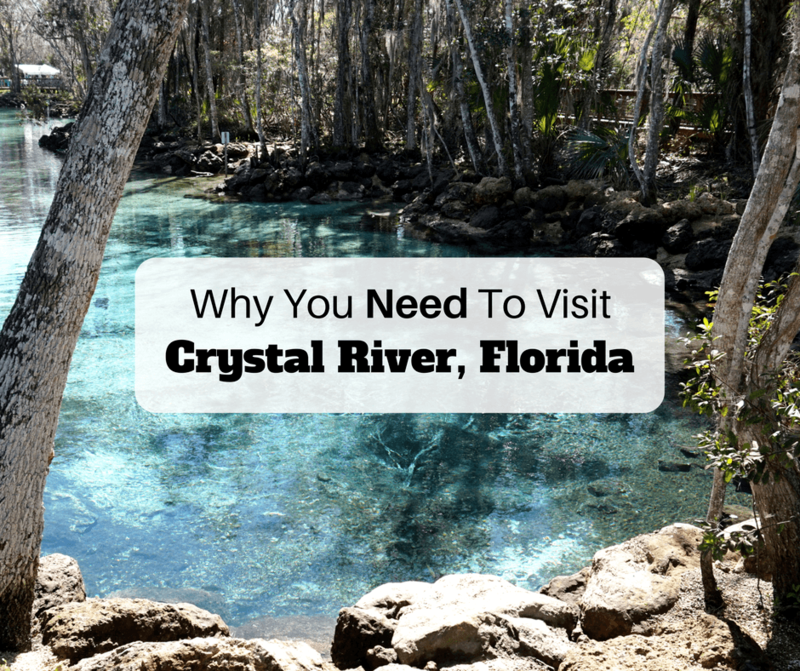 We’d always heard of Crystal River and how beautiful it was and were excited to take a weekend and explore this area of Florida that we had never been to. It certainly did not disappoint and we now believe that it is a Florida destination that everyone should visit. Crystal River is considered to be the “Manatee Capital of the World” and one of the best ways to get to know these cuties is to go for a swim with them. “Passive observation” is allowed by the federal government in the area of Kings Bay, so you can literally get up close and personal with manatees. For more information on passive observation and swimming with manatees, check out our more in depth post. This wildlife refuge is gorgeous! Photos just don’t do it justice, so you have to see it for yourself. The different hues of crystal clear blue water are amazing and you’ll get to explore trails and see all kinds of local animals. Manatees, of course, are the main attraction, and the best time to see them is during winter months. We recommend visiting at any time of the year though. Their boardwalk makes it really easy to get around and they also offer guided walking tours. Welcome to historic downtown Crystal River! This charming area of Crystal River has specialty shoppes and cafes located along North Citrus Avenue. It’s a great place to walk, eat, pick up some unique gifts, and admire the buildings themselves (many of which are considered “Historic Homes” and are designed with wrap around porches and tin roofs). We especially recommend stopping by Tea House 650 for some refreshing tea! Without a doubt, Crystal River has incredible sunsets. A great place to go during the evening to watch the sun go down is Fort Island Gulf Beach. It is off-the-beaten path, free to enter, has picnic tables and pavilions, and plenty of parking. Enough said! This state park is a great place to see native Florida wildlife. Daily programs and animal encounters offer visitors a chance to learn more about some of the animals in the park, such as manatees, alligators, otters, snakes, etc. There’s also the “Fish Bowl” which is really cool because you get to step down into an underwater observatory and see what’s swimming around in the springs. To visit, park your car at the visitor center. From there you can either take a boat or tram to the park. The tram is faster, but the boat is nice because it goes along Pepper Creek and a park ranger tells you about the history of the park and the area. Fun Fact: The only non-native animal in the park is Lu, a hippopotamus that was declared an honorary citizen of the State of Florida. Once a thriving sugar plantation owned by David Levy Yulee, the space is now a state park with the remains of some of the sugar mill parts and equipment. You can see a 40 foot limestone masonry chimney, iron gears, and a cane press. There are signs all around explaining how the mill worked and the equipment. It’s not a large park and walking around will only take a few minutes, but if you’re in the area we think it’s a pretty cool thing to check out. Whenever we find out there’s a veteran’s memorial in a place that we visit, we always stop by to pay our respects. It was a little hard to find (it’s not in Google Maps) but it’s right across from Homosassa Elementary School so if you search for that you’ll find it. Crystal River has a lot of great dining options. We wrote a whole post about where to eat in Crystal River, which details some of our favorite restaurants and cafes. From tacos to steaks, you’ll be sure to find something delicious. Another great thing about Crystal River is that it’s a great place to base yourself to explore even more areas of Central Florida. Tampa and Orlando are each only an hour and a half away. So if you want to experience big city hustle and bustle, but still want a quiet and relaxing place to end the evening, Crystal River is perfect. We personally can’t wait to go back and explore more of Crystal River. It’s natural beauty and wildlife are stunning and we know that there are a lot more activities and eateries we want to try out. Although hours are limited, it’s worth the time to visit the Coastal Heritage Museum on Citrus Avenue. A local history museum located in the old City Hall building with many artifacts and displays depicting early Pioneer times. It also has one of the original jail cells. Managed by the all-volunteer Crystal River Heritage Council, a council of the Citrus County Historical Society. Open Wednesday through Saturday from 11am to 3pm. Free. I have wanted to see manatees in the wild since I was a kid obsessed with marine life. Totally making a mental note to visit Crystal River to swim with the manatees! How cool was that?!? That water is spectacular, both in color and clarity! I would love to go for a dip, but is it safe from water snakes and crocodiles? And those historic buildings (cottages) and quaint neighborhoods are my favorite kind of place to explore and take photos! Great suggestions! I have been to Florida but I haven’t heard of Chrystal River before. I would love to swim with the manatees but apart from that I see there are tons of nice activities. Hi Chrysoula! Yes, it’s a great destination with a lot of things to do! I would totally love to go swimming with manatees. I had no idea it was allowed, and it is good to know that it can be done, albeit responsibly and safe for the manatees. I’ve actually never heard of Crystal River, and I spend a fair amount of time in Florida, so it’s good to know for my future visits. Looks like a unique and fun destination in the Sunshine State! I haven’t been here, but it has everything I like in a destination – small town, natural setting and activities, wildlife, history. Makes me wish I lived closer. I think you’d really love it Lara! I hope you’re able to visit one day! Thanks for another great post guys. I have been loving your Florida series and every post makes me want to go more and more. Crystal River has long been on our radar specifically for swimming with the manatees but you post shows that there is so much more to see and do (and eat) there. How great you can swim with manatees as a passive observer. I hope people respect this! I’ve seen too many places that had to ultimately change their rules because someone was desperately trying to get the perfect selfie. Three Sisters Springs does look amazing! I wouldn’t have guessed Florida, but somewhere in Central America. Hi Jackie! Luckily, everyone is very passionate about manatees and their well being in this area, so tour companies and those that work in the parks are very vigilant to prevent any wrong-doing. And yes, it’s such an amazing and beautiful place. I hope you’re able to visit some day! I would love to swim with the manatees. Learning more about passive observation was also very insightful! I also love the vibrant colors of Three Springe Sisters! I want to swim with manatees, too! Passive observation sounds like an approach that should be taken in tourism more often. All of these Florida activities sound great. I’m ready to pack my bags now. Thank you for this! We just moved back state-side after living abroad for years. We’ve been adding to our list of places to explore now here in the US and these are perfect kind of places for us! Crystal River is old Florida ….generations of families where fishing was their life. The water is beautiful, the ride out of the river passing Shell Island spectacular, not to mention the wonderful restaurants and shopping. You will love the small town feel and the beautiful scenery. There is no other place in Florida like it. Well worth the time to visit. I know it well as I was lucky enough to grow up there. You had me at swimming with Manatees ! Funny enough, the only thing I know about them comes from my kids watching the Cat in the Hat! But I would love to share that experience with them! This looks like a great family vacation! What a cool experience swimming with manatees! I’d love to do that! Not familiar with Crystal River though it really looks like really a quaint town with lots of activities. I’m always down for a nice glass of wine 🙂 Thanks for sharing your pictures and experience. Crystal river is beautiful – we visited once during my year living in the States, and it was definitely one of the prettiest parts of Florida. Sadly the day we visited the visibility wasn’t all that great and there were a lot of tourists crowding trying to see the Manatees, but still loved it all the same 🙂 Took our canoe and had a great time! I am totally convinced. The Crystal River seems so picturesque and worth visiting!